In the 2 months that followed the announcement by US President Donald Trump regarding the move of the US embassy to Jerusalem, tensions have escalated in the region to its highest since August. The following is a breakdown of what has transpired, and where it has transpired to. The statistics apply for the period of December 6th, 2017 through Feb 20th, 2018, unless specified otherwise. 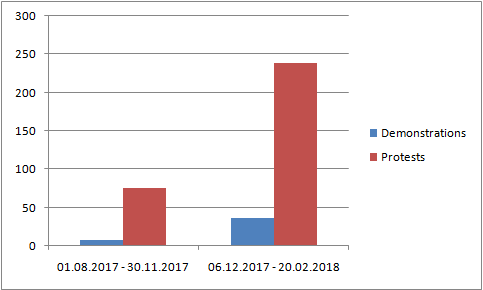 Clashes between Palestinians and ISF skyrocketed in December, 2017. Following a 4 month period when clashes didn’t exceed 125 incidents a month, 595 clashes were reported in December alone, more than the previous 4 months combined, and 223 in January. Between December 6th and February 20th, the clashes were concentrated in the Jerusalem district with 20% of the reported clashes, Ramallah & Albireh 19%, Bethlehem 6.5%, Nablus 14% and Hebron 12%. A Military operation is the coordinated military actions of a state in response to a developing situation. These actions are designed as a military plan to resolve the situation in the state's favor. In December 2017, 202 operations were reported while 247 operations wrere reported in January 2018 . 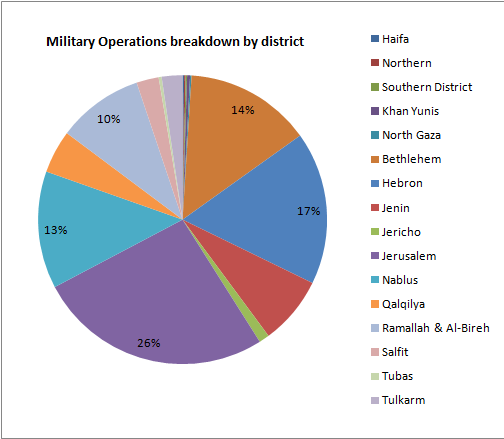 Most of these operations occurred in Jerusalem (26%), Hebron (17%), Bethlehem (14%) and Nablus (13%). *United Nations Office for the Coordination of Humanitarian Affairs. The December 6th through February 20th period saw 37 demonstrations and 239 protests. The 4 month period, August 1st through November 30th, only saw 8 demonstrations and 75 protests. 30 casualties were reported in December and January alone, a 58% increase on the combined number of casualties between the months of August and November.